Created in 1989, Art of the Matter is the producing body for Deborah Slater Dance Theater (DSDT), and Studio 210. DSDT is a professional dance & theater company dedicated to production of evening-length works exploring timely social issues. Founded by Artistic Director/Choreographer Deborah Slater, DSDT has been touring more than two decades. AOTM/DSDT celebrates Studio 210’s 36th year of continuous operation as a rehearsal and performance facility in San Francisco’s Mission District and Deborah Slater Dance Theater’s 27th year of existence. Created in 1989, Art of the Matter is the producing body for Deborah Slater Dance Theater (DSDT), and Studio 210. DSDT is a professional dance & theater company dedicated to production of evening-length works exploring timely social issues. Founded by Artistic Director/Choreographer Deborah Slater, DSDT has been touring more than two decades. AOTM/DSDT celebrates Studio 210’s 36th year of continuous operation as a rehearsal and performance facility in San Francisco’s Mission District and Deborah Slater Dance Theater’s 27th year of existence. Some Studio 210 highlights include: the ENGAGING THE IMAGINATION festival, featuring Anna Halprin and Deborah Hay, workshops by renowned artists like playwright Octavio Solis, the 210 Residency Program, as well as use by hundreds of Bay Area musicians, dancers, actors, directors, fashion designers and photographers. Children’s dance, adult acting and rehearsals happen weekly. DSDT honors: Artistic Director Slater, with playwright Julie Hebert and ODC producer Rob Bailis were awarded a 2011 Gerbode Playwrighting Grant. Ms Slater was selected for a 2010 CHIME ACROSS BORDERS Mentorship with David Gordon, a TBA Mentorship with Berkeley Rep Artistic Director Tony Taccone and a 2008 CHIME Mentor grant, mentoring Cynthia Adams; a 2007 Izzie for Hotel of Memories; an NCCI grant for residency/performance at F&M College in Pa, funded by DANCE USA; and selection in 2006 & 2008 for Residencies by the Wells Fargo Center for the Performing Arts. Other Awards & Funders include – multiple SF Arts Commission grants, grants from the Phyllis Wattis Fdn, the Walter & Elise Haas Fdn, Fleishhacker, the Stanley S. Langendorff Fdn, Zellerbach Family Fund and the Vanguard Fdn. Additional awards include a TBA CA$H grant, and 9 NEA Fellowships. Ongoing grants include SF Hotel Tax/GFA as well as private donors. DSDT is a roster artist of Young Audiences and Creative Education Consulting. Ms. Slater is a 9 year Mentor for the Vision Series for High School and Emerging Choreographers. She is a co-founder of CIRCUIT NETWORK and was an Executive Committee Member of the Djerassi Resident Artist Board for 6 years. "With the grounding and dramatic focus she displays in both movement and acting, Slater is well-suited to the complex demands of her pieces. ...Slater can take full-throttle acrobatics where they have never gone before, into expression of the deepest subconscious." 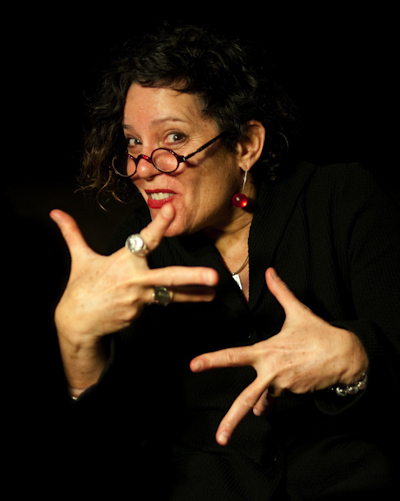 Deborah Slater, performer, director and choreographer, has worked for the Magic Theater, A Traveling Jewish Theater, SOON 3, San Diego Repertory Theater, Theaterworks, Word for Word, and The Pickle Family Circus to name but a few. She is the co-founder of Circuit Network Management, artistic director of Deborah Slater Dance Theater and founder and artistic director of Art of the Matter Performance Foundation. AOTM is dedicated to the idea that art and everyday life are not, in fact, separate events, but that Art is the human attempt to find meaning and sense in the chaos of the life experience. With a background in Theater, Modern Poetry and Dance, selected collaborators include: writer/performer Rinde Eckert, playwright/director Julie Hebert, director David Ford, composers Carla Kihlstedt, Matthias Bossi. Erling Wold & Bill Fontana, videographer and lighting designers Elaine Buckholtz & Allen Willner and Emmy award-winning filmmaker Chris Beaver. Ms. Slater’s work has been inspired by artists and scientists alike including poet-laureate W.S. Merwin, Sleep Specialist Dr. William Dement and painter Alan Feltus. She has choreographed for solo performers including Bill Talen, Sara Felder, and Deke Weaver. Ms. Slater is the recipient of 9 NEA Fellowships (including a prestigious two year grant) and Deborah Slater Dance Theater is funded in part by the California Arts Council, the Zellerbach Family Fund, the Vanguard Foundation, the Fleishhacker Foundation, the San Francisco Arts Commission, San Francisco Hotel Tax/Grants for the Arts, CA$H, the Phyllis Wattis Fdn, the Stanley S. Langendorf Fdn, and private donors. Slater’s work has been nominated for multiple Isadora Duncan Dance Awards, winning in 2007 for Hotel of Memories. Grants include a Chime Mentorship grant (as Mentor) and a TBA Mentorship with Berkeley Reps Artistic Director Tony Taccone in 2009, a Chime Across Borders grant with choreographer David Gordon in 2010 and a Gerbode Foundation Grant with playwright Julie Hébert and Producer Rob Bailis/ODC Theater. She has been chosen for 5 Djerassi Foundation Residencies. Recent grants include a major Kenneth Rainin Fdn grant for the completion of PRIVATE LIFE. Deborah Slater has taught at the California College of Arts, the American College Dance Festival, OLLI (Osher Lifelong Learning), the Fromm Institute, San Francisco State, Cal Arts and Stanford. Deborah Slater Dance Theater was chosen for the Pilot Program for CAC Rural and Inner City Presenting, the roster of Young Audiences of Northern California (ongoing), and the Selected National Roster, ‘Artists for the Millennium’, Mid-Atlantic Arts Foundation, l999-2000. She was on the Steering Committee for National Dance Week in SF for many years and served 6 years on the Executive Committee of the Board of Trustees of the Djerassi Resident Artist Foundation. "Her creations stay with you because they are formally inventive, finely crafted, and engage the mind and heart long after you leave the theater..."
"Deborah really is equal parts artist and scientist! When she's hot on the heels of a new work, she collects an incredible wealth of 'data': from her dancers, visual artists, the news of the world, writers such as myself, and anyone or anything else that is relevant to her internal creative compass. If you get to work with Deborah, you're privy to a wealth of great conversations. Her 'holistic', inherently ecologic approach to story is what makes DSDT productions exciting for me whether I'm involved behind the scenes or taking a seat in front of the house. DSDT is theatre from the expression of heart and soul, made visceral by the highly skilled dancers she employs to narrate her chosen focus. More importantly Deborah's work is timely. It's not about yesterday, but about how we live and breath and move, now, in the world and with one another."